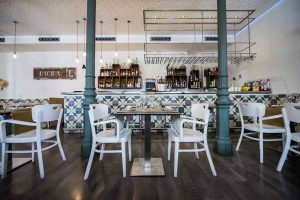 In the heart of Madrid’s fashionable Chamberí district life lies a gem of a restaurant called Bacira. 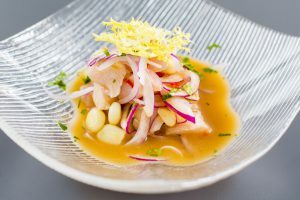 The cuisine is Mediterranean fused with Asian influences and the 3 chefs have an impressive culinary CV behind them, having worked together at a former well-known Peruvian-Japanese restaurant in Madrid, Nikkei 225. Bacira exudes a calming uplifting atmosphere with its simple pale green and white décor and our delicious exotic variations of the classic Pisco Sour cocktail raised our expectations of exciting food to come. We were not disappointed. A lot of the dishes can be ordered in full or half portion sizes to share which provides a great opportunity and/or excuse to sample the majority of the menu! 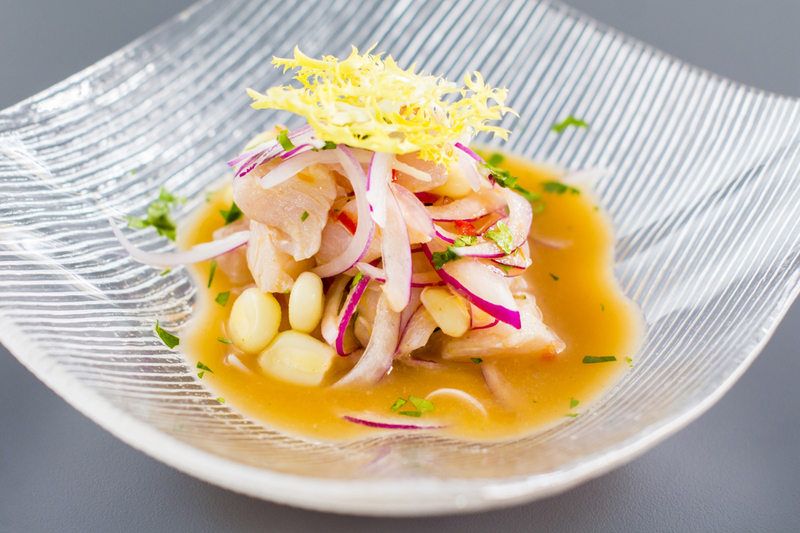 Starters include elegantly-prepared classics such as Ceviche de Corvina (Seabass Ceviche), Tiradito of Bass “a la bilbaína” which is a red pepper and garlic sauce that hails from Bilbao. Other starters we enjoyed included Flambéed Scallop Nigiris Tobiko (flying fish roe) with Peruvian Yellow Ají Chilli Pepper and Prawn Carpaccio. 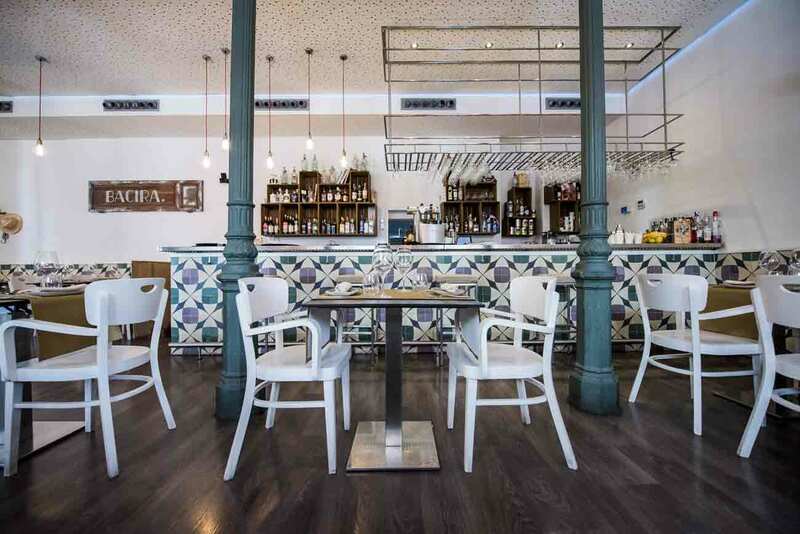 The wine list is extremely well-priced and includes several welcome options from outside Spain. For our mains we tucked in heartily to Bacalao asado con romescu, calçot y espuma de alioli y ají panca (Baked Cod with Romesco almond and garlic sauce, scallions and garlic mayonnaise foam with Panca Chilli) and Carrillera de Ternera al Curry Verde (Braised beef cheek Green curry) which were all delicious examples of well-balanced flavour pairings. Never one to miss an opportunity for madrileño specialities, my husband added Curried Callos (Tripe!) to the order just for fun which brought a lasting smile to his lips. We ended off this exciting fusion experience with a Hendricks Gin Sorbet and a mouth-watering chocolate, raspberry and pink peppercorn concoction. 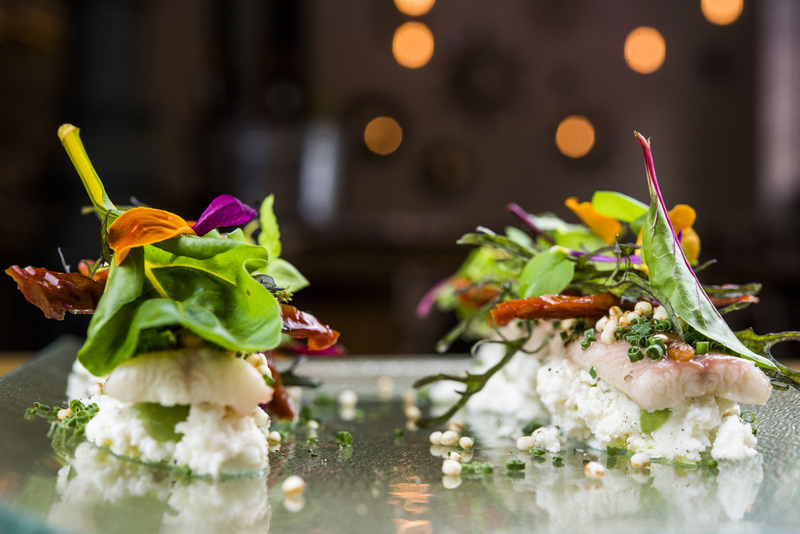 The highly knowledgeable and attentive service together with the carefully considered fusion pairings have put Bacira firmly on our “To Return To” list.